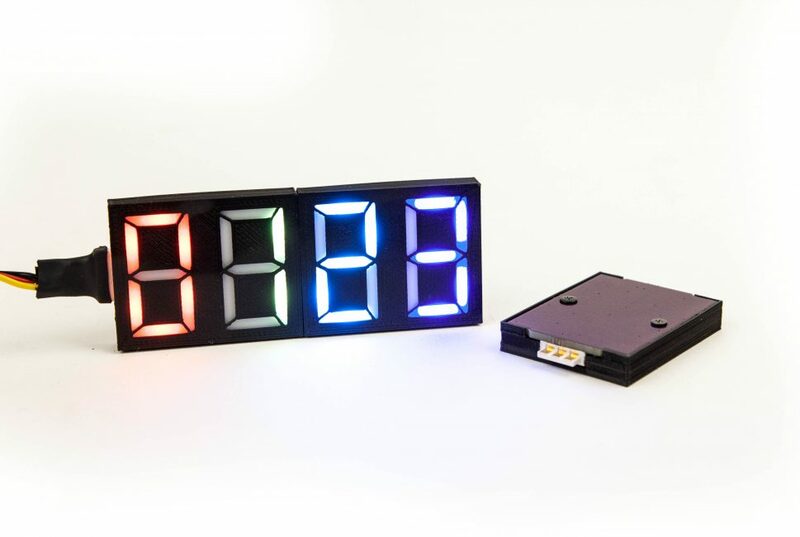 Friend of Maniacal Labs and contributor to BiblioPixel, Maksim, has created an awesome full RGB 7-segment display module based on the WS2812B (NeoPixel) LED. These awesome little modules simply snap together and provide full RGB control over each segment of each digit, allowing for some pretty awesome effects. Plus, they are certainly the easiest 7-segment modules to interface that we’ve even seen. He’s running a crowdfunding campaign right now over at CrowdSupply. The new NeoSegment module for BiblioPixel automatically handles dealing with writing numbers and text to each digit and provides a full built-in font covering a good facsimile of every character. For all the details on using it with the NeoSegment, check out the GitHub Repo. We wish the best of luck to Maksim on this and future projects and hope to see awesome projects made with BiblioPixel and the NeoSegment!